Polycom VVX 5.5.1 firmware was released along with BToE 3.4.0.0, Polycom VVX Firmware Download Site, I’ve been beta testing and beating up these VVX builds (lost count, probably 15+) since March, so I’ve been anticipating this day for awhile. Soooo many features being added that I’m just giddy. The biggest item in my opinion is the QoE reports generated by the phones and feed to the Skype Monitoring servers. Yah, we can now see how the phones are performing and the quality of the calls. 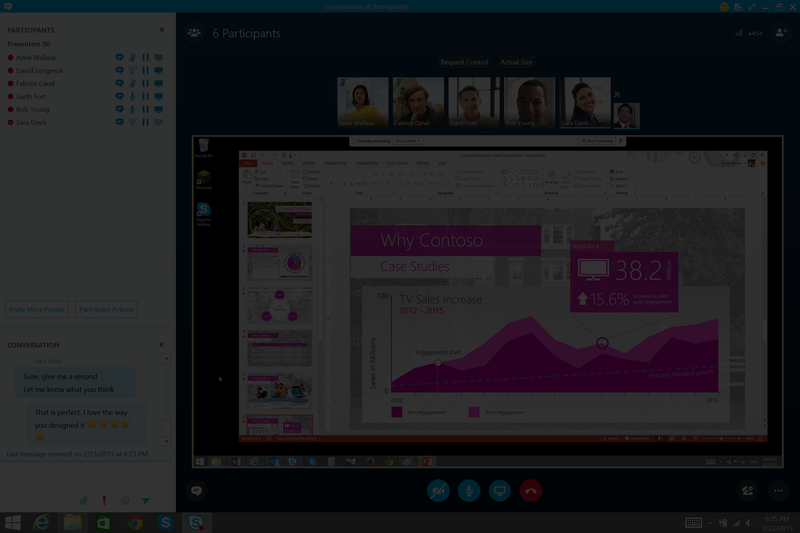 Of course there is the Skype branded UI interface. Additionally there is a IP Pairing feature, however I’m not seeing it in the release notes and may still be in beta. It works for me but I am waiting to see if I need permission to share how to set that up. In this software version, users who transfer calls can more easily choose between Blind and Consultative transfers. On the Call Transfer screen for the user’s default transfer type, the user can press More to access a new soft key to change to the alternate transfer type. For example, if the user’s default transfer type is consultative, a Blind soft key is displayed. Distribution lists are available on the following VVX business media phones: VVX 201, VVX 300/310, VVX 301/311, VVX 400/410, VVX 401/411, VVX 500/501, VVX 600/601, and Polycom VVX Expansion Modules. You can configure phones to be protected with a lock code that enables users to access personal settings from different phones. You can configure Device Lock on the Skype for Business server or using Polycom parameters on a centralized provisioning server. If you enable Device Lock using both methods, centralized provisioning parameters take precedence. You cannot enable or disable Device Lock using the Web Configuration Utility or from the phone menu. Administrators can use this feature to allow users to automatically or manually pair their VVX business media phone with their computer using the Polycom Better Together over Ethernet Connector application. Users can select the pairing mode in the Web Configuration Utility or in the Features menu on the phone. By default, BToE PC Pairing is enabled for phones registered with Skype for Business. When administrators disable BToE pairing, users cannot pair their VVX phone with their computer using BToE. In order to use this new functionality, you must install both BToE Connector App 3.4.0 and UC Software 5.5.1. For best results, Polycom recommends that you deploy BToE Connector App 3.4.0 before you deploy UC Software 5.5.1. To help troubleshoot user issues, administrators can enable or disable for users the ability to upload diagnostic logs from the phone or Web Configuration Utility and set log levels from the phone menu. This feature is available on all VVX business media phones registered with Skype for Business Server on-premises or online and with Microsoft Lync 2013 or 2010 Server. The user interface for VVX 500 and 600 series business media phones was updated to match the theme used in the Skype for Business client. This feature is enabled by default on VVX 500/501 and 600/601 phones with the Lync/Skype Base Profile or SKU. Administrators can migrate users’ contacts to Microsoft Exchange Server to enable synchronization when users manage contacts or contact information from an application or device, for example, the VVX business media phone, Skype for Business client, Outlook, or Outlook Web Application from a mobile device. Web Sign-in enables users to securely log in to Skype for Business from the phone using a computer web browser or mobile device. Users can sign in concurrently to a maximum of eight devices by default. When users are signed in to multiple devices and sign out from one device, users remain signed in to all other devices. This sign in option is available only for Skype for Business Online deployments. Imaginet can help with Skype for Business servicing, planning, updating and scaling. View more about our offers below! Korbyn is a Microsoft Unified Communication (UC) Technical Director with over 15 years of extensive hands on experience with communication, collaboration and telephony solutions. Korbyn possesses in-depth knowledge of the latest technologies and best practices, specifically with the Microsoft Unified Communications platform. He has a tremendous UC project experience having worked on the strategy, design, architecture and implementation of highly complex global deployments of Lync, Exchange and OCS solutions. Korbyn‘s technical leadership and business acumen often have him speaking as an industry leader at Microsoft events.